Bobby Cleveland spent nearly three decades as a salesman, traveling across the state and around the country and the world, where he learned valuable lessons in dealing with people, large organizations, and the power of persuasion. One of his primary customers was retailing giant Walmart, from whom he learned about product efficiency and customer service. 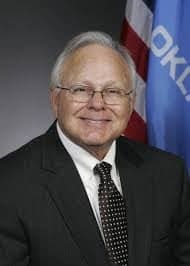 In 2012, left the private sector and was elected to the Oklahoma House of Representatives, where he served three terms and earned the reputation as a fiscal conservative and the champion for Oklahoma's corrections system. members as Mayor. Bobby was recognized for his leadership as Mayor when he was selected by the Oklahoma Municipal League as Oklahoman’s Small Town Mayor of the Year in 2012. Bobby also served on the Cleveland County Excise Board for twelve years. Bobby has also been active in Republican party politics, having twice served as a Presidential Elector for Oklahoma, and as Chairman of the Cleveland County Republican Party. To give the party more presence and exposure, he helped found the Cleveland County Republican Lunch Club and brought speakers on public interest topics to inform the public on timely conservative issues. As the Representative for Oklahoma House District 20 (Cleveland, McClain, Pottawatomie and Garvin counties), Bobby had a near perfect attendance and voting record. In the six years, he only missed 5 days. During the 56th Oklahoma Legislature, Bobby served as Chairman of Public Safety. Bobby was the principal author of House Bill 2545 in 2016, that amended law to protect correctional officers by prohibiting the State and private prison companies from requiring them to work two sixteen shifts in a seven day period. Bobby was also a leader in the Legislature during his career in advocating for criminal justice and prison reform and funding. Bobby also was an advocate for Second Amendment rights, including concealed carry; the First Amendment right of freedom of information; and the Sixth Amendment right to jury trial. For his efforts he has been recognized by the NRA, OK2A, the Oklahoma Press Association, and the Oklahoma Bar Association. Copyright 2017 Oklahoma Corrections Professionals. All Rights Reserved.